¾ cup of unbleached white flour. 1 cup of diced rhubarb. ½ cup of skim milk. 1 tablespoon of grated ginger root. Paper liners or cooking spray. 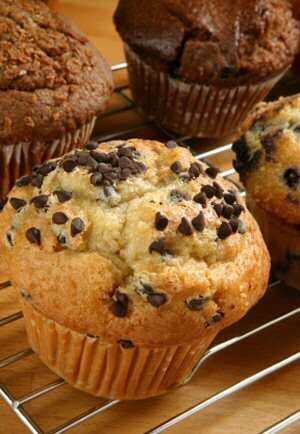 Line 12 muffin cups with paper liners or spray with oil. In a bowl, combine the oats, flour, diced rhubarb, baking powder and salt. In another bowl, stir together the honey, milk, egg, grated ginger and canola oil. Form a well in the dry ingredients and pour the milk mixture into the well. Divide the batter among prepared muffin cups and bake for about 18 minutes or until the tops are golden and spring back when touched.